In a few weeks, mother grizzly bears will emerge from their winter dens, introducing their cubs to a brave new wilderness world. In January, even as they dozed, the typical mother bear gave birth to two tiny cubs the size of teacups. For the next two years, bear moms will keep her cubs safe while teaching them how to find food — where to scavenge winter-killed bison in spring, dig yampah roots in the summer, and feed on squirrels’ caches of whitebark pine seeds in fall. Grizzlies need to become obese, in technical medical terms, if they are to survive the four to five months of starvation that comes with hibernation. Through this urgent need for food, grizzly bears offer us a window into the complexity of ecosystems. They eat everything from ants to bison plus hundreds of plants in between. Grizzlies know when and where foods are most palatable and nutritious. This means that grizzlies are keen observers of the subtlest details of the natural world. And when it comes to foraging, Yellowstone grizzlies are unique. Greater Yellowstone is the only place left where bears still feed on buffalo, a relic of what was once commonplace in the western U.S. Compared to populations such as Glacier’s, Yellowstone grizzlies eat a lot more meat, mostly elk and bison, either by scavenging or outright predation. Grizzlies’ reliance on whitebark pine seeds and army cutworm moths also sets Yellowstone’s grizzlies apart from other bear populations not just in North America, but the northern hemisphere. Despite their foraging prowess and immense physical power, grizzly bears are acutely vulnerable. They have one of the lowest reproductive rates of any terrestrial mammal. Even under the best of circumstances, a female grizzly is lucky to replace herself with another reproductive female during her lifetime. Partly because of this vulnerability, ecologists consider grizzly bears to be an umbrella species. The health of grizzly bear populations engenders health for entire ecosystems. Native Americans have a different and perhaps more evocative way of making the same point. They have an old story of a bear that goes into her den to dream the world into existence each winter. She dreams of antelope, and whitebark pine, and buffalo. She creates entire ecosystems. When she emerges in the spring, trailed by young cubs, she is celebrated by all the creatures of the earth. Whatever the mythic connections, hibernation is nothing short of a miracle. Bears don’t eat or drink or excrete waste for 100 to 180 days. If it were you or me, we would be long dead. But they crawl out of their dens in the spring basically healthy. They don’t lose much bone strength or muscle mass — 30% at most. Their kidneys, liver, and heart don’t fail. Of course, none of this is lost on medical researchers. They have long suspected that bears could benefit people with heart disease, diabetes, osteoporosis, as well as traumatic injuries. If you could induce hibernation in someone with a stroke or undergoing cardiac arrest, you could buy doctors precious treatment time. You might even get people to distant planets. The bear, with its ability to seemingly die during winter and emerge in the spring with new life, has long symbolized transformation to ancient peoples. More practically and perhaps more intimately, native peoples looked to the grizzly as teacher, guide, and kin. These affinities are not surprising given that bears are so much like humans in their ability to stand upright on hind legs, eat the same foods, and fiercely protect their young from danger, including from humans who come too close. VIDEO: WHAT MAKES A BEAR? Yellowstone’s bears are of just five grizzly bear populations left in the lower-48 states. Before Europeans arrived, as many as 70,000 grizzly bears roamed from the Mississippi River to the California coast, and from Canada to Mexico. In just 60 years, between 1850 and 1910, European settlers eliminated grizzlies from over 90% of this range. Armed with rifles and the narrative of Manifest Destiny, frontiersmen were hell-bent on taming the West in the name of progress. What they lacked in numbers, they made up for in motivation. The passage of the Endangered Species Act (ESA) in 1973 represented a dramatic shift in public attitudes towards wildlife to one based more on reverence and respect. There is little doubt that protections offered by the ESA since 1975 rescued grizzlies from extinction. Under the ESA, sport hunting of grizzly bears was banned. Yellowstone Park cleaned up its management of garbage, which meant that fewer bears got hooked on human foods and were subsequently killed. Habitat was protected and restored on degraded National Forest lands outside the Park. Still, progress towards recovery has been slow. Yellowstone’s current population of roughly 640 to 740 grizzly bears is about double its size during the 1970s. While this represents progress, these numbers are still far fewer than the 2000+ widely considered by experts to be necessary for long-term viability. To achieve this goal, Yellowstone’s currently isolated grizzlies would need to be reconnected with bear populations to the north and west. This would involve expanding measures to coexist with grizzlies. Fortunately, we have learned a lot over the years about what works to keep bears alive and humans safe. Carrying bear pepper spray, keeping clean camps, and sound livestock husbandry practices are all proven, commonsense measures. For hunters, prompt removal of dead game from the woods can reduce hazardous confrontations with grizzlies. Electric fence has proven to be effective in deterring grizzlies from beehives and calving pastures. And, livestock guardian dogs can reduce depredations, especially of domestic sheep. Significant work is being done to promote coexistence practices all along the Continental Divide between the Yellowstone and Glacier ecosystems. The imperative for connectivity is amplified by the fact that Yellowstone’s ecosystem is unraveling for grizzly bears. Although Yellowstone grizzlies eat over 200 different foods, paradoxically, they have historically depended on just four foods for most of their energy and nutrients: seeds from whitebark pine, meat from elk and bison, army cutworm moths, and cutthroat trout. Two of these critical foods were essentially wiped out between 1995 and the mid-2000s. Trout in Yellowstone Lake have been victims of drought, climate warming, and predation by a non-native fish. Mature cone-producing whitebark pine has been clobbered by the spread of a non-native fungal disease called blister rust and by an unprecedented climate-driven outbreak of bark beetles. That leaves only two of these historically critical bear foods more-or-less intact: army cutworm moths and meat from large herbivores. Yet even these foods are diminished or severely threatened. Most elk populations have declined dramatically from highs reached during the 1990s and early 2000s, and moths are imperiled by the projected disappearance of their alpine haunts from climate warming during the next 50 to 100 years. 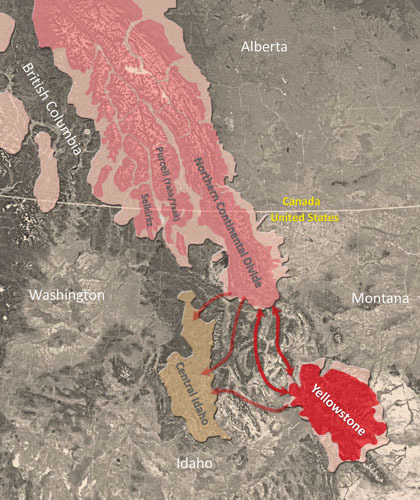 Map of suitable and occupied Grizzly bear habitat in the Northern Rockies with potential connections to Yellowstone. Red denotes core habitat, pink is peripheral habitat. In 2016, the US Fish and Wildlife Service proposed removing Endangered Species Act protections for Yellowstone grizzly bear, citing a recovered population. A final rule is expected in 2017. Delisting would return management authority over grizzlies to the states of Wyoming, Idaho, and Montana. These states propose a renewal of a sport hunt on grizzly bears and freer killing of bears involved in conflicts to reduce the size and distribution of Yellowstone’s grizzly bear population. Questions about management, remaining threats, and current status of the population have precipitated a fierce public debate. The outcome will shape the future of grizzly bears in the Greater Yellowstone Ecosystem, as well as other species covered by this umbrella species. A record-breaking number of comments — over 650,000 — were submitted on the draft rule to remove ESA protections, with 99% expressing opposition, including world-famous scientists such as Drs. Jane Goodall, George Schaller and E.O Wilson. These scientists are concerned that delisting and sport hunting would again drive the population back to the brink of extinction. They argue that Yellowstone’s grizzly bears need access to more wild country to compensate for the loss of critical foods and the ongoing threats posed by climate change. In an unprecedented show of concern, 120 Indian tribes also expressed opposition to the removal of protections, with a prospective sport hunt leading to the murder of animals they consider relatives. The tribes are seeking formal government-to-government consultation and co-management of grizzlies that live on reservation lands. Some groups support the removal of ESA protections, including ranchers who would like greater opportunity to kill bears involved in livestock conflicts. Sport hunting groups, such as the Safari Club, support delisting because of the promise of trophy hunting. And the energy industry sees a removal of protections as a prelude to accessing areas previously protected for grizzly bear conservation.